As a leading supplier of materials handling equipment, ThyssenKrupp Industrial Solutions has developed a complete range of products for the bulk handling process, including: stockyards; bulk terminals; fertilizer, steel and cement plants; and mines. combined portal scraper reclaimers with both stacking and reclaiming functions. belt conveyor, curved conveyors and pipe conveyors. design suitable for upgrading to either fully automatic operation or unmanned remote controlled operation. Recent technical achievements and contracts highlight ThyssenKrupp’s development work for the coal handling in terminals and stockyards. The mechanical, hydraulic and electrical equipment are engineered and manufactured in Germany and Western Europe, while the whole steel structures of the machines are fabricated in China. The steel structure and mechanical parts will be manufactured there under the permanent QA/QC by ThyssenKrupp and then assembled with all mechanical, hydraulic and electrical parts delivered from abroad. The blending yard stacker is designed for the stockpiling ROM iron ores in layers with a capacity of 8,300tph (tonnes per hour), while the bridge type bucket wheel reclaimer, having a design capacity of 5,600tph, will feed the concentrate process plant continuously for controlled mixtures of raw materials. After the process plant a stockyard is arranged with a stacker and a bucket wheel reclaimer for buffer storage of iron ore concentrates. The stacker receives the materials from the plant and stockpiles them at a rate of 2,500tph. For shipment of the product, a bucket wheel reclaimer takes the stockpiled material back to the conveyor system and further to the railway train loading station. To match the train loading operation the reclaimer will feed the conveyor line at a design rate of 6,000tph. The car dumper is designed as single cell tippler, designed for a maximum capacity of 5,400tph. The stacker is designed for the handling capacity of 6,000tph to match the car dumper capacity, while the design capacity of bucket wheel reclaimer and the shiploader is 10,000tph each. This configuration gives the port operator one distinct advantage over its competitors in that region, which will also help cut costs by reducing the ship’s berthing time. Modern drive control and PLC system is incorporated in the machines, operation is mainly controlled via the computerized operator’s panel for the stockyard machines and in the operator’s cabin for the shiploader. The high degree of automation and the visually assisted operator’s guide the operating staff to operate the machines easily and in a comfortable fashion. Back in 1994, the new power plant in Guangzhou City, Zhujiang power plant received ThyssenKrupp’s ship unloaders for its coal terminal and put into operation. Since then these ship unloaders have been operating successfully to serve the power plant demand on coals for 3 × 600MW blocks and transshipment of coals for the region. An annual turnover of 6–8mt (million tonnes) is achieved by these unloaders. With the increase of power consumption in this region, the power plant began the expansion project of Phase II for the other 1,000MW block. Through an international tender, ThyssenKrupp won again the new order for a further two ship unloaders, and this time chain bucket elevator continuous ship unloader. future for 100,000dwt, representing outstanding success of ThyssenKrupp in China by covering >75% of market share. For ThyssenKrupp, this follow-up order not only means being awarded a further order, but also represents continuity with respect to design, supply, construction and management and demonstrates the client’s appreciation of and satisfaction with ThyssenKrupp’s performance to date. The delivery to site and commissioning of the new CSU is schedule for end of 2013, the commercial operation was scheduled to start in February of this year. With this contract,ThyssenKrupp has once again contributed to the development of China’s coal ports and power plants along with other equipment of more than 60 machines for car dumpers, ship-unloaders, shiploaders, stacker-reclaimers, and more. SUCCESS STORY OFTHYSSENKRUPP FOR EMOTERMINAL,THE NETHERLANDS In the early 1970s, PHB and Krupp delivered the first ship unloading and stockyard equipment for the newly constructed EMO terminal. Since then, Krupp and PHB, later PWH, today integrated into ThyssenKrupp Industrial Solutions, have designed the entire ship unloading, shiploading, wagon loading and stockyard equipment for the EMO terminal. Today the terminal, located at Maasvlakte right at the entrance to Rotterdam’s Seaport, is the largest import and export terminal in Europe for dry bulk material with an annual unloading capacity of 42mt. Continuing and even increasing demand for coal and iron ore, in particular from German steel mills and power plants, as well as the construction of two new coal fired power plants directly at Maasvlakte has now lead to further investments for the terminal. In the past five years, EMO placed orders to ThyssenKrupp for two units BW machines and last one KB 7 has been installed and commissioned 2012 and put into commercial operation 2013. KB7, as well as all the other EMO stacker/reclaimers, have been designed to mainly handle coal and iron ore.Although the respective material properties are quite different, the machines nave been designed to reclaim and to stack each of these materials at the same capacity. This is achieved by using variable conveyor and bucket wheel speeds. During the stacking operation, up to 6,000tph of coal or iron ore can be conveyed to the stockpiles. With a boom length of 60m, the machine is able to stack piles up to 60m wide and 24m high. Besides the bucket wheel, the slewing mechanism is also driven by a slow running hydraulic motor in order to be able to control the slewing speed while protecting the mechanism from peak loads. Due to the fact that KB7 is an exact copy of KB6, and many of the parts and components are also identical to the other stacker/reclaimers, which have all been supplied by ThyssenKrupp, the spare parts management has been kept simple. These similarities also apply to maintenance and operation. The operation has now been changed over from manual operation to unmanned fully automatic mode. While KB7 is the largest stacker/reclaimer in Europe, the unloader No. 5 is, together with its neighbour cranes No. 3 and No. 4, are the largest grab-type ship unloaders in the world. With its span of 70 m, its overall construction height of 70m and its waterside outreach of 50m, the machine is able to unload even the largest existing coal and iron ore bulk carriers. Apart from unloading ships the machine is able to serve an emergency stockpile which can be situated between the hopper installation and the landside leg. The rope-drawn machine trolley with a working range of 102m comprises the hoisting and closing winches, each driven by two motors of 780kW which can list the 85-tonne load at speeds of up to 180m/min. By means of a grab cross-travel mechanism most of the movements alongside the ship during the unloading process in a single hold can be realized without travelling of the portal. The electrical power feeding of the equipment installed on the machine trolley is realized by means of a power cable on a catenary system situated below one beam of the bridge girder. The unloader travels on a double rail system at both water and landside and is supported on 56 runner wheels with 900mm diameter. Fourteen drives, each with 55kW, accelerate the unloader with the total weight of over 3,000 tonnes up to speeds of 25m/min. With the flexible hopper discharge mechanism, which comprises of two apron feeders and two reversible distribution belt conveyors, it is possible to serve each one of the four quay conveyors at full unloading capacity. Increasing demand in particular for coal for German power stations has resulted in the existing three wagon loading stations being brought to the limit of their capacity. After the procurement of wagon loading station WB 3 (successfully commissioned by ThyssenKrupp in 2006) EMO decided to install a further wagon loading station WB 4, the commercial operation of which is scheduled for May 2011. WB4 spans three parallel rail tracks and is able to serve two of them.Above the third rail track an operator’s cabin has been integrated in the tower structure. In addition to having an excellent view of the loading process of WB4, it is also possible to monitor WB3 which is in the direct neighbourhood. gates. As soon as the preset material content of the weighing bin has been achieved, the double-radial gates of the weighing bin are opened to allow a constant filling of the wagon to be loaded. During the loading process the wagons are pulled with a constant speed by a robot train. With a two-way chute directly installed underneath the weighing bin, both of the loading rail tracks can be served. The decision of EMO to award THYSSENKRUPP with all three of their important contracts represents continuity in the long-standing relationship and demonstrates the client’s appreciation of and satisfaction with ThyssenKrupp’s performance to date. The choice went in favour of ThyssenKrupp after strong international competition. GIANT SHIPLOADERS AND CAR DUMPERS FOR COAL TERMINAL OF CAOFEIDIAN IV, CHINA From 1999 to 2008 ThyssenKrupp successfully supplied more than 18 high-capacity shiploaders for ships up to 200,000dwt and at 6,000/8,000tph and more than 12 high capacity car dumpers to the ports around Bohai Bay of Northern China, the most important China’s coal terminals. The success story could be continued by a further award of four additional shiploaders and two quadruple car dumpers which are proven as the largest ones in size in China. At the end of 2013, milestone contracts were awarded to ThyssenKrupp for design, supply and installation of four 6,800tph shiploaders and two car dumpers for coal by Huaneng Corp. China for their new coal terminal, Caofeidian No. 4 Coal Terminal. 360° slewing. With this option it is possible to achieve homogenous filling of the corresponding ship holds up to the uppermost edge, at a high nominal loading capacity. All of these machines are designed to load ships at a rated capacity of 6,000tph. (maximum 6,800tph.) and for Capesize ships and down to very small ships sizing to 15,000dwt. In order to save the space of the jetty, a special design for the tripper car is adopted in the shiploaders. Each base machine is equipped with a luffing boom, shuttle head with pin rack and pin drives loading spout and trimming chute. All mechanisms including for the belt conveyor are equipped with variable speed drives by means of frequency converter. Modern drive control and PLC system is incorporated in the shiploaders, operation is mainly con-trolled via the computerized operator’s panel in the operator’s cabin. The high degree of automation and the visually assisted operator’s guide in Chinese allow the operating staff to operate the machines easily and in a comfortable fashion. For environmental protection a dust suppression system by means of water spray is installed with suction pump, water tank, spray pressure pump and spraying nozzles for all transfer points and the loading spout and cleaning compressed-air line. Special measures are also taken in the design to the transfer points and materials flow for a better and functional sealing of the chutes and skirting. These giants will take shape, with commissioning expected in 2015 for putting into commercial operation. The award of the contract for two quadruple car dumpers by Huaneng Corp. China for its Caofeidian IV Coal Terminal is a breakthrough achievement for ThyssenKrupp in China for this kind of car dumper, following up its success in China back in 2000. The expansion project will make it possible for Huaneng Group to export annually 40mt coal. Each new car dumper has the same unloading capacity as the existing one, but with increased capacity of hauling railcars of longer and heavier trains arriving the port. The new car dumpers shall be designed on the basis of the car dumpers ever built for China since 2000, however adopt a lot of improvement in the hydraulic system, special mechanisms for the rotor and drives and in the environmental facilities. These measures will ensure a high reliability and performance, so that the annual throughput of 40mt by facility of only two car dumpers. good relationship with Chinese partners for manufacturing and erection. In 2015 both car dumpers will be installed and commissioned for putting into commercial operation in the terminal, and a annual throughput of coal of more than 100mt, delivered by the company own railway and unloaded by the eight car dumpers supplied by ThyssenKrupp, will be reached. In 2013,ThyssenKrupp won a milestone contract from Shougang Hierro Peru for its iron ore mine expansion project. Shougang Hierro Peru, the Chinese mining and steel company, will begin to expand the production capacity of its iron ore smelter at San Juan de Marcona, on Peru’s south coast. The expansion will allow the refinery to increase production to additional 10mt per year. The iron ore of the company’s mineral exports is mainly for shipment to China. 1. One semi-mobile primary crusher plant with a high capacity gyratory crusher. 2. One curved overland belt conveyor system, in total 6km long. 3. One downhill overland belt conveyor system, in total 6km long. 4. One ROM ore blending yard plant with stacker, drum reclaimer and belt conveyors. 5. One product stockyard plant with stacker, bucket wheel reclaimer and conveyors. Back to the 1960s Krupp built one downhill conveyor system for the Marcona Mine, which is since then in operation for transport the iron ore from the open pit crusher plant down to the beneficiation plant of 10mt a per year more than 50 years and still in very good condition. This is one of the reasons that the client decided again for ThyssenKrupp. The primary crusher plant equipped with a ThyssenKrupp’s gyratory crusher of compact design is the key equipment for the expansion project, which will produce 10mt crushed ROM ore annually for the further process of the whole mining and beneficiation plant. In front of the beneficiation plant the ROM ores should be blended on a storage and blending yard. This is equipped with a slewing and luffing stacker and a blending drum reclaimer. The blending yard stacker is designed for the stockpiling ROM iron ores in layers with a capacity of 4,500tph, while the drum reclaimer, having a design capacity of 3,000tph, will feed the beneficiation plant continuously with controlled mixtures of raw materials. The drum reclaimer is designed for bi-directional reclaiming operation, a specialized design to meet Shougang’s requirements, that very high grade of blending of materials (sorts, sizes, etc) shall be achieved. This is the first installation of bi-directional reclaiming drum reclaimer in Peru. This is ThyssenKrupp’s first foot print of for a full range of high capacity iron ore mining and handling equipment set in Peru. Sandvik is a major provider of stockyard systems. You can be sure that wherever bulk is being handled, Sandvik Mining’s Product Area Mining Systems will be present. As well as meeting the needs of the mining industry, the company also excels in meeting the needs of downstream operations, such as power plants and mills, ports and terminals with an approach tailored for each application. Reclamation, stockyard storing, sizing, homogenization and transportation are all materials handling processes that Sandvik supports. The offering for turn-key projects, individual new equipment or upgrades and modernizations includes consulting, systems design, engineering, procurement, erection and support. Sandvik applies materials handling and automation technologies to help customers best utilize their assets. Additionally Sandvik designs and manufactures a full range of conveyor components like idlers, pulleys, belt cleaners, etc. used in materials handling equipment, whether for new systems or replacement parts for any existing system. The goal is to make the customers more successful through long-term co-operation and partnerships; success comes from efficient process design, innovative engineering and a dedication to reliability. Through the well- developed Sandvik Mining and Construction organization, global parts logistics and local services keep the continuous materials handling processes running. This offering supports the continuous transfer of the material in various fields of materials handling solutions, whether as individual machines or as complete turnkey installations. The classical application of these systems and machines relates to stockyard facilities at mines, at export and import ports and in stockyards of power stations, steel works and processing plants. According to the requirements of the downstream consumer, Sandvik’s systems can reach output rates up to more than 10,000tph (tonnes per hour). auxiliary equipment with hoppers, feeders, crushers, etc. Covered storage is used where environmental aspects require the full enclosure of the stockpiles and stacking and reclaiming activities. It can either be arranged in the form of a longitudinal/rectangular configuration or in a circular configuration covered by dome-type structures. Sandvik stackers effectively stockpile bulk materials in an efficient and orderly manner. Stationary or travelling, borne on rails or crawlers, they can be supplied in fixed, luffable or luffable-and- slewable boom designs, with capacities from 150tph to 20,000tph. The choice of design depends on factors such as the stacking method and size of the stockpile, the type of material, the required throughput and the demand for mobility.Tripper cars or tripper systems for transferring material from the yard conveyor to the stacker are considered part of the stacker. Sandvik reclaimers are designed to reclaim bulk materials from stockpiles at mines, ports, steel plants, power stations, etc. in a quick, efficient and orderly way. They are available in several main types, including bucket wheel, scraper and drum-type reclaimers, and in many configurations and sizes, with capacities from 500tph to 20,000tph and more. The choice of design depends on factors such as the size and shape of the stockpile, the type of material to be reclaimed, the required reclaiming rate and the need for blending or homogenization. Sandvik stacker/reclaimers come in two main types: bucket-wheel models for alternate stacking and reclaiming, and circular units, which normally stack and reclaim the material alternately but can be designed to do so simultaneously if required. The bucket- wheel models, normally supplied complete with tripper cars, are compact and economical for longitudinal stockyards where simultaneity is not required and where there can be large variations in the demand for stacking and reclaiming capacity. Standard circular units, which build a ring-shaped stockpile and are normally housed inside a covered dome because of environmental aspects, both continually stack the stockpile at one end of the ring and reclaim the material simultaneously from the other end. Sandvik has a highly skilled projects division specializing in the design, manufacture, installation and commissioning of conveyor systems for a full range of applications. It also upgrades and modernizes systems and supplies a comprehensive range of its own quality components and spare parts. Mining companies strive to maximize their production rates whilst keeping high safety standards to ensure a safe working environment for the employees. This leads to increasing attractiveness of fully or partially automated solutions for mining and materials handling equipment. Automation & Smart Services as part of Sandvik Mining Systems Customer Services has invested considerable efforts in automation, in the enhancement of their stockyard equipment by introducing auxiliary automation systems for different applications, such as collision avoidance and stockpile profiling, to name just a few. The automation package consists of state-of- the-art radar and laser sensors including dedicated software for data processing and interfaces to the machine PLC software via common industrial platforms. The collision avoidance system for stockyard equipment can be used in both stackers and reclaimers to provide protection against moving equipment as well as to prevent impacts with stockpiles, as well as for shiploaders to reduce the risk of property damage. Stockpile profiling systems are being applied in bucket-wheel reclaimers. This add-on functionality further increases the machine’s vision by scanning the face slopes and by adjusting the machine parameters in a predictive manner according to the shape of the stockpile benches. These systems increase the level of automation on the machines and thus their serviceability for both the manually operated and the automated machine type without operator. Based on the type of application a different set-up and allocation of the sensors is required. For collision avoidance systems it may be necessary to allocate the sensors against other moving targets whereas for stockpile profiling they scan a solid ground and map its exact shape by creating 3D images, which are stored in an inventory database. “The key requirements of the systems is the robustness of the sensors, fast signal response and reliable measuring results in order to increase the machine availability and to maintain high productivity levels of the machines under all operational circumstances”, says Branco Lalik, Product Line Manager for Surface Materials Handling, Sandvik Mining Systems. The auxiliary automation systems for collision avoidance and stockpile profiling for stackers and reclaimers are specified according to the demands of Sandvik’s customers. They will be integrated into the Sandvik in-house developed PLC software and the complementary SCADA system. All around the world, sea-going and coastal vessels are constantly being loaded or unloaded with different bulk materials. In order to ensure a thriving international sea trade, to load the material at the export terminal and unload the vessels in the import terminal, to store the material at the ports continuously and in a very short time, a high standard of perfection in port-handling methods is needed — an area where Sandvik has vast experience. Sandvik ensures a smooth transfer to and from bulk terminals with a complete offering of reliable ship unloading and shiploading equipment. Many different developments for all capacities and applications are included in Sandvik’s range of shiploaders which provide travelling, telescopic, luffing and/or slewing as well as radial functions. The ship unloading of high-density bulk material at fast flow rates is conducive to the company’s offering of grab-type unloaders of gantry or level luffing design. 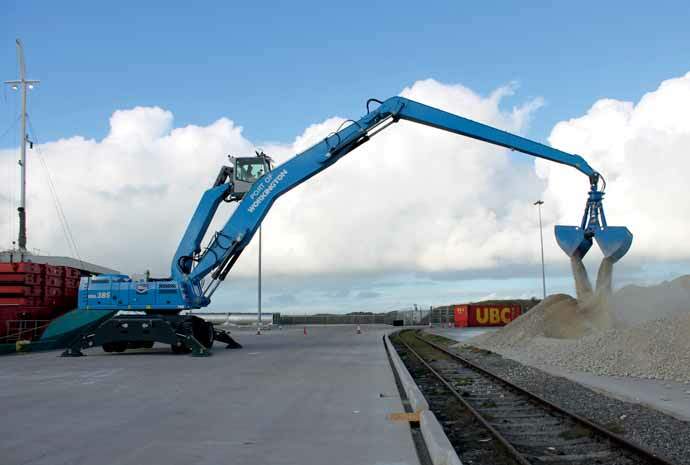 For the intermediate storage of bulk materials in ports, Sandvik’s complete range of stockyard equipment and systems incorporates stackers, reclaimers and stacker/reclaimers. semi-automated and fully-automated operation integrated in a central, remote control system. Sandvik linear gantry and quadrant bridge type shiploaders are constructed in proven, eco-friendly designs with a wide range of sizes to service vessels from 5,000 to 250,000dwt. Central to the Sandvik philosophy is minimal disruption of the port during installation of the shiploader and its supporting equipment. Its process for off-site construction, assembly, testing, commissioning and heavy-load transportation is highly advanced, resulting in installation of fully operational shiploaders with capacities up to 20,000tph in just a few days. The range includes a variety of shiploaders which provide travelling, telescopic functions, luffing and/or slewing installed onto longitudinal jetties, or radial shiploaders which incorporate a fixed pivot point. Sandvik ship unloaders of the linear gantry and level-luffing types are constructed in proven designs and a wide range of sizes to service vessels from 5,000 to 250,000dwt. Focusing on grab technology, they offer efficient, rational solutions to demands for quayside flexibility and are the perfect rigs for unloading materials with different bulk densities. As with continuous ship unloaders, they can be constructed, assembled, tested and commissioned off-site if necessary, then shipped to site and installed with minimal disruption to port activities. materials handling applications covers HC-series belt conveyors and HF-series belt feeders, both having fixed and mobile units. With a wide range of standard modules and components these devices can be tailored exactly to meet the needs of the application. The advantages of the mobile equipment make them ideal and cost-effective in conveying and stockpiling materials. Sandvik Mining Systems Customer Services is a strategic partner to all customers in managing their mining and material handling equipment by supporting them with most safe, reliable and efficient services. Sandvik’s customer services offering portfolio is a collection of different programmes aimed to ensure peace of mind for all customers. Machine Availability Plan is a collection of technical services designed to drive continuous machine performance of supplied mining and material handling systems. Life Enhancement Program combines engineering expertise with major refurbishments and upgrades to assure the overall integrity and productivity of any mining and material handling system. Spare & Wear Parts is a programme of services with their parts packages that will support customers during entire life- cycle of equipment. Automation & Smart Services offer optimization of the equipment, increasing their safety, productivity and autonomous operations. EHS Improvement Services will support customer to reach higher standards in Environment, Health and Safety features of their equipment. Telestack continues to innovate with regards to providing technical solutions to its clients on material bulk handling issues. One such innovation has recently involved the accurate blending of differing grades/ qualities of coal within a power plant in South East Asia. In any given power plant stockyard, there will be various grades and specifications of coal which will have been sourced from various countries in various batch sizes. Each of these grades will have a differing value of the following main material characteristics. A. calorific value; B. ash content; C. sulphur content; and D. moisture content. The challenge with any power plant operations team is how to accurately blend the various grades of coal with the above varying material characteristics to ensure that they are sending a consistent blend to the furnace. Traditionally this blending has been carried out by using two stacker/reclaimers that feed onto a central conveyor which then sends the blended coal mix to the furnace. The main issues with this method of blending is that the blend ratios can vary dramatically and, therefore, one of the stacker/reclaimers may be operating at a greatly under utilized rate. This results in high operating costs per tonne for the process of reclaiming at these lower rates. For example: a power plant may want to blend an Indonesian coal of lower calorific value with that of an Australian coal with a higher calorific value. The total reclaim rate to the furnace is 1,400tph (tonnes per hour). If using a 80% Australian to 20% Indonesian blend, then the stacker/reclaimer A is operating at 1,120tph while the stacker/reclaimer B is only operating at 280tph. The operating costs per tonne for stacker/reclaimer B as a result are excessive. Also the design of many power plant stockyards allow for both stacking of imported coal whilst unloading vessels and simultaneous reclaiming of coal from the beds to the furnace. However, when unloading vessels and stacking, a typical layout would incorporate two ship-unloaders and these would feed material to two stackers. This normally only leaves one stacker/reclaimer to send material to the furnace, so blending cannot be carried out when unloading vessels. If reclaiming sub- bituminous coal, this can result in the de-rating of power generation. This can also occur during periods when carrying out repair and maintenance on a stacker/reclaimer when the unit is not in operation. This can put additional pressure on other reclaimers when carrying out normal day to day reclaiming/stacking duties. Telestack listened to the issues facing the operations team of the power plant and worked in conjunction with them to offer them a unique and innovative technical solution to the above operational issues. The equipment selected was a Telestack TU1015R mobile track mounted truck unloader with integrated hopper feeder with radial and luffing boom. The machine was selected because of its excellent mobility and manoeuvrability around the narrow areas of the stockyard and narrow access roads between the stockpile and the reclaim line. The radial boom enabled the machine to fit within the 5-metre area and reach the reclaim line. The fully self contained machine with Cat 96kw diesel engine and 4.1 metre crawler tracks allows the unit to travel over rough terrain especially in the rainy season when heavy rutting can occur on access roadways. The Telestack TU1015R has a fully integrated feed hopper to allow the trucks/ wheel loader to ‘dump’ and go, thus improving the cycles times and efficiency as well as allowing better control of the material onto the incline section. The integrated hopper is specially designed using a chain apron belt feeder which combines the strength of an apron feeder along with the sealing quality of a belt feeder. The boom is radialled by a slew gearbox and drive, which turns on an external slew bearing on which the boom is mounted. This gives greater control when positioning the boom over the reclaim line and combined with the luffing ability from 0–23°, this allows the operator to precisely place the boom. The Telestack design ensures versatility in that it can be fed by front end loader/excavator or trucks. When reclaiming the machine is fed by one or a combination of the above and can be set at pre-set percentage ratios with the touch of a button. The Telestack TU1015R can work in conjunction with a Stacker Reclaimer to send an accurate blend to the furnace. The unit incorporates a dual idler belt weigher which is connected to a PLC on the machine; this PLC controls the feed rate to the reclaim line and can be linked to the central control room via an ethernet connection or a wi-fi communication system. emergency reclaiming in event of breakdown/ or planned maintenance of stacker reclaimer. In summary, the machine can be used to complement existing fixed stockyard infrastructure and can give the operations team additional capacity for reclaiming and flexibility with regards to stockyard management. Sometimes stockyard equipment, including the mammoth stacker shown here, has to be kept under cover. Often, the material being handled is potentially harmful to the environment. In this case, copper ore is being stored in central-western Peru, and the client needed to find a contractor that could supply appropriate coverage — this is where Geometrica stepped in. EL BROCAL: STRENGTH AND BEAUTY HIGH IN THE ANDES In Peru and elsewhere, mining is often controversial. But El Brocal, Peru’s largest publicly traded precious metals mining company, is committed to preserving the environment wherever it operates. This commitment extended to the architecture of its new storage building for copper ore in Cerro de Pasco in central-western Peru. Cerro de Pasco, high in the Andes, is 14,200 feet above sea level — one of the highest-altitude cities in the world. The landscape is stark, and beauty is found in simplicity. Here, Geometrica’s structural beauty blends with the environment. Equally important, the enclosed structure protects the environment from the dust generated when the copper ore is moved to and from storage. Geometrica’s structural system attracted the attention of the director of PHB Weserhütte, S.A.’s technical department, José Ramón Prado, who saw Geometrica’s Aguas Teñidas domes at a copper, zinc and lead mine in Andalucia, Spain. The combination of strength, beauty and flexible construction appealed to Prado, and he was further impressed with the economy of the Geometrica system. “We are very satisfied with the building,” said Javier Vizcarra, El Brocal projects and construction management assistant. The new storage structure was to be built within a constrained space, which meant that copper ore must be delivered via a tripper conveyor suspended along the length of the building’s apex. Therefore, the building’s shape had to support both wind and live loads efficiently. It also needed a structure strong enough to support the weight of the conveyor equipment, as well as the loads, vibrations and impacts created by the conveyed copper ore. Furthermore, even in the constrained space, El Brocal management mandated that construction take place with minimal interruption to its nearby mining facilities. The structure was remarkable in two ways: Geometrica combined its mechanical joint system with high-strength welded steel. Second, the tripper support was a completely separate framework that was assembled and joined after the longitudinal structure was complete. “The finished structure is light and beautiful, yet strong enough to resist the tripper loads,” said Tamez. Once the structure was designed, Geometrica set about assembling the components in its Monterrey, Mexico, fabrication facility. Four months later, the components were shipped in containers to the construction site--bar-coded, labelled and packaged in the correct order for easy, flawless and fast assembly by local labourers. To build the structure, the contractor assembled half arches on the ground, then lifted them with cranes and joined them at the apex of the structure. The arches were joined with Z purlins and bracings. The end wall was assembled in traditional Geometrica fashion, by assembling ‘spiders’ on the ground, then lifting them into position. The tripper likewise was assembled in sections on the ground, then lifted to its position and joined after the longitudinal structure was complete. The assembly took about six months. In fact, Geometrica is currently manufacturing over half a kilometre of longitudinal structures that are similar in design to El Brocal’s. They will be installed in various countries around the world. The new ore-storage building was constructed by Geometrica at Mina El Brocal in Cerro de Pasco,Tinyahuarco District, Peru. Depending upon the commodity, such as coal, iron ore, grains, sugar, etc. specific stockyard systems are required. Open or and undercover storage alsorequirestaskspecificequipment. Materiallikescrapneedsacompletelydifferentloading/unloadingandstoragesystem. Normally coal and iron ore arrives at the port for export by wagons or barges. It is unloaded by wagon tippers or barge unloaders and transported via conveyor systems to the stockyard. Some export terminals have several million tonnes of material in stock. Export countries with such large stockyards are in Latin America, India, China, Australia, etc. For food in-door/covered systems or silos are preferred in combination with covered conveyors. Scrap is one of the most complicated goods to be handled, starting with unloading of the vessels and the transfer to the scrap yard. Incoming scrap by vessel is quite often compacted and is difficult to unload. Some steel mills combine the unloading of vessels and scrap storage. Scrap has to be separated into different qualities. The perfect solution for these tasks is hydraulic cranes. High performance, robust design make it the crane of choice. RHC and manufacturing partners in Europe and China provide customized material flow and stockyard solutions for the bulk material handling industry; outdoor and under cover storage systems, conveyors and task specific optimized material handling systems for all dry bulk material as well as food, feed and biomass. RHC is a German engineering team that bridges the customers need for reliable equipment based on European design and engineering criteria, combined with the outstanding value proposition of equipment manufactured in China and/or Korea. Famak S.A. is a Polish company, and is among the market leaders in the manufacture of industrial steel structures, machinery and constructions. The company has been in operation since 1945, serving customers from all lover the world. S.A. is the design, manufacture and commissioning of a stacker/reclaimer for the Port of Gdansk in Poland. The original assignment was a challenging one. On average, the jib of a stacker/reclaimer is around 20–30m long. On this occasion, the client needed the jib to be a staggering 50m long. Lukasz Warczyk, the commercial director of Famak S.A. in Kluczbork, explained that achieving this — and a total stacker/reclaimer length of 122m — presented its own unique challenges. The Port of Gdansk is large, and requires a comprehensive range of specific cargo operations needing highly specialist handling and storage technologies. Therefore, the stacker/reclaimer had to be large enough to cope with the demands of handling the loose cargo. The stacker/reclaimer supplied by Famak S.A. is 700 tonnes in weight, and took 13 months to manufacture and start up once it had been designed. for 4,000tph (tonnes per hour), while loading capacity is 2,000tph. As a result, the unit can function together with two modern port cranes and a wagon loading station. The LZKZ 1000.50 stacker/reclaimer, as a double-function machine, is designed to stack loose materials in a stockyard, or to take them from the stockyard and transferring them onto conveyors. Famak, based in Kluczbork, Poland, has highly qualified technical-engineering staff with interdisciplinary knowledge and experience, and design-development base, who implement the highest technical level in the products that are offered by Famak S.A. In the production of equipment and services to its customers, Famak S.A. aims to meet the needs of its customers, and to retain their trust and good opinion. It is a strong believer in environmental stewardship, and implements stringent measures to ensure that its products are as ‘green’ as possible. It also follows all the relevant regulations in terms of health and safety requirements. Tenova TAKRAF is a major supplier of a wide range of bulk materials handling products and services, including equipment used in bulk stockyards. It is a global leader in the mining and bulk handling equipment suppliers’ industry. It combines German and Italian engineering skills with a worldwide organization on all five continents. The company has a versatile wealth of experience in development, design, fabrication, erection, and commissioning of open cast mining equipment and bulk material handling facilities. Tenova TAKRAF is the result of the successful merger of Tenova Bulk Handling activities, strong of the renowned Italimpianti heritage, and TAKRAF with origins that can be traced back to 1725, and that has been designing and supplying equipment and technology to the mining industry for almost a century. Tenova TAKRAF has two development centres for bulk materials handling systems in Leipzig, Germany and in Genoa, Italy. These centres have pooled their expertise and resources from both experienced companies,TAKRAF and Italimpianti. Tenova TAKRAF is now recognized as a full line provider from the mine site of materials handling to loading/unloading, maritime and train transport. Following a long history of systems development and supply in the area of bulk materials handling, Tenova TAKRAF has put in place various stockyard systems and export terminals around the world — systems which are today operating reliably in the harshest geological and weather conditions occurring. State-of- the-art technology applied to those systems generates optimum speed of bulk transport, provides secure materials’ transfer involving environmental safeguards, operational automation to name a few. Additional to this standard of technology,Tenova TAKRAF supplies bulk materials handling systems that operate reliably during heavy snowfall and in lowest temperatures down to –45°C. Reference projects, such as one of the most modern export coal terminal of Ust-Luga in the Baltic Sea Area of Russia, operated by Rosterminalugol, or the coal terminal in the export harbour of Wanino, at the Pacific coast of Russia, operated by SUEK, show evidence of Tenova TAKRAF’s vast capabilities in planning, constructing, fabricating, delivering and erecting, and all connected services to new development and/or expansion of plants involving bulk materials handling systems. track/ trail ranges — from 4 to 12. Tenova TAKRAF is capable of supplying stackers with boom lengths up to 200 metres. Whatever the material,Tenova TAKRAF can supply the most appropriate stacker for the material to be stacked and the parameters of the stockyard. Tenova TAKRAF has developed numerous reclaimers for special demands with bucket wheel boom length up to 80 metres. For special operations Tenova TAKRAF supplies stacker/reclaimers with boom lengths up to 80 metres. span width ranges — from 20m to 50m. The capacities of circular stockyard scraper reclaimer designs are similar to those of portal, side or bridge type scraper reclaimers. Here the outer diameters of the circular piles range from 60 to 120m. belt length ranges — from 40m to 15,000m. use belt feeders with high capacity. fully automatic operation, with semi automatic and manual operating modes available. American Group of Companies. The three rail- mounted machines, a bucket wheel reclaimer and two stackers, operate on the stockyard of the Sishen South Mine from where the ore is sent to the Saldanha Export Terminal via rail. Sishen South is located approximately 90km from the existing Sishen Mine near Postmasburg in the Northern Cape Province. The machines are to a large extent replicas of existing machines which TAKRAF supplied to the Sishen Mine several years back and which have been working to the client’s satisfaction ever since. The robustness and proven reliability of the TAKRAF machines were important factors in Kumba’s decision — the suitability of the equipment to the rugged mine environment and adherence to high quality and safety standards are of utmost importance. The iron ore is stacked in two different qualities, fine ore and lumpy ore, at a rate of 1,150tph (tonnes per hour) and reclaimed at a nominal rate of 5,500tph (peak rate 7,500 tph). Expanding its export facilities in Ust-Luga, Krutrade AG awarded Tenova TAKRAF the fourth contract in a row for expansion stage IV of the erection and extension of the coal export terminal at the Baltic Sea side. Whilst erection phase III at the stockyard and pier, supplying one shiploader with tripper car, seven conveyor systems for the wagon-tippler site and the sea-site, and diverse auxiliary equipment, all equipment complying a capacity of 3,500tph, Tenova TAKRAF received the order of one more stacker with tripper car, and one more bucketwheel reclaimer, also of 3,500tph capacity, as well as the extending belt conveyors to restore the terminals storing and exporting capacity exceeding 12 mtpa (million tonnes per annum). From contract closing to commissioning of the fourth expansion-stage a time frame of 24 months was given. Within the fourth expansion stage of the coal terminal a fourth stack- pile area in addition to the three already existing pile-tracks was built. The stockyard equipment, as well as the conveyors operate at a capacity of 3,500tph. The stacker has a boom length of 55m, and the reclaimer has a wheel boom with a length of 58m. Aligned to the already existing conveyor system, the new conveyors have a belt width of 1,600mm and transport the coal at a speed of 4.5m/s. In total the new conveyors added up to 1.5km in length. With over 600 employees worldwide and subsidiaries in Canada, USA, Chile, Brazil, India, Australia, South Africa and Bulgaria there are representative offices on all continents Tenova TAKRAF develops system solutions so they are close to the customers. Tenova TAKRAF benefits from a global network of highly qualified staff, their technological expertise and proficiency ensures the supply of reliable, high-capacity and durable plants and machines, equipped with the most modern key technologies. Tenova TAKRAF provides worldwide service for equipment and machines thanks to the modern production facility based in Lauchhammer, Germany. Over 400 projects are carried out each year. Council, the port’s owner, and is the latest stage in a major expansion into container handling and developing the port into a key player in European multi-modal logistics with modern, multi- modal terminal transferring cargo between sea and road or rail. The port handles around 300,000 tonnes of imported cargo every year, with over 250 cargo vessel movements. Materials include both dry and liquid bulks, timber and agricultural products and recyclables. The port’s main cargo handling facilities are on the Prince of Wales Dock which has a 773m quay frontage with seven berths as well as a ro-ro facility. All berths are rail connected and the port authority also operates its own locomotive on the port’s own extensive rail system. Port of Workington’s operations and safety manager Liam McAleavey reports that they are delighted with their new Terex Fuchs acquisition, particularly focusing on the excellent performance and the impressive elevating and forward-reaching cab which provides the operator with a raised line of sight, so important for the safe and efficient extraction of cargoes from vessels’ holds by giving a clear view right into the depths of the hold itself. The new machine was delivered with its own 4m3 clamshell bucket, which is augmented by Port of Workington’s own specialist attachments which include hook, bale clamp and pulp spreader beam. Vessels of between 2,000dwt and 8,000dwt are being unloaded and stockpiled by the Fuchs-machine, with annual volumes of 20,000 tonnes of gypsum, 50,000 tonnes of wood pulp, 24,000 tonnes of SRF and seasonally variable loads of fertilizer and animal feed being the main cargoes. The Main-application of the MHL385D is unloading bulk of the vessels and stockpile the material for the additional processing in our facility.